Steve McQueen, as "The King of Cool" embodied the anti-hero counterculture mood of the 1960s. 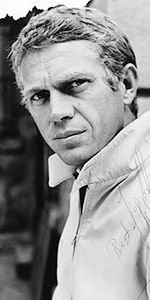 After a very fast rise, McQueen became one of the most popular stars in the world. McQueen's father was a circus barnstorming flyer, who left his mother Julia, after only six months. Unable to handle motherhood, Steve grew up with his grandparents in Slater, Missouri, then in 1933, they all moved in with Uncle Claude on his nearby farm. Steve became a good Catholic boy. Uncle Claude gave Steve a red bicycle for his fouth birthday, launching a lifelong obsession with speed and auto racing. Moving to Indianapolis to live with mother Julia and stepfather, who beat him, Steve left home at age nine, and began running with a street gang. He was sent back to live with Uncle Claude. Meanwhile, Julia divorced and married again, asking Steve to be sent to live with her in Los Angeles. The new stepfather and young Steve fought — physically — immediately. Sent back to Uncle Claude, Steve ran away to join a circus at age 14, then drifted back to Julia in Los Angeles. Caught stealing hubcaps, stepdad threw the miscreant down the stairs. Steve vowed to kill the man if he laid hands on him again. He was sent to a state-run boys home, where he began to mature some. After becoming famous, McQueen would return to the home to talk to the boys. At age 16, he joined the Merchant Marines, but abandoned ship in the Dominican Republic, becoming a bouncher in a whorehouse. Eventually finding his way back to Texas, he drifted through a series of jobs. In 1947, he joined the Marine Corps. After going AWOL, he spent 41 days in the brig, during which time, he decided to embrace the USMC code of discipline. He saved the lives of five Marines during an exercise, and worked in the honor guard on president Harry Truman's yacht. Studying acting in New York on the G.I. Bill, McQueen studied with Stella Adler. He also began to race motorcycles out on Long Island. He made his Broadway debut in A Hatful of Rain, taking over the lead role of Johnny Pope when Ben Gazarra left the show in June, 1956. McQueen did a lot of television work, appearing on shows such as West Point in 1957, The Big Story in 1957, Climax! in 1958, Tales of Wells Fargo in 1958, Trackdown in 1958 and so on. Trackdown star and co-motorcycle racer Robert Culp taught McQueen how to do the "fast draw" with a sawed off shotgun for his role as a bounty hunter. The character worked so well that McQueen got his own show: Wanted: Dead or Alive for 94 episodes, airing over CBS, from September, 1958 to March, 1961. Right when Wanted: Dead or Alive went on the air, Steve's kinda-dumb, kinda-not sci-fi movie The Blob (released in September, 1958), came out, making him a star in two mediums. A low-budget caper film The St. Louis Bank Robbery (released in September, 1959), was already in the can, but Frank Sinatra put Steve in a co-starring role in Never So Few (released in December, 1959), working with director John Sturges for the first time. Sturges cast McQueen in his western The Magnificent Seven (released in November, 1960), with the result that Yul Brynner, would come to resent what he felt was McQueen's attempts to upstage him. Their director let him. You decide. After the World War II film Hell is for Heroes (released in June, 1962), with Bobby Darrin, Sturges placed McQueen front and center in his epic prison camp movie The Great Escape (released in July, 1963), with James Garner. McQueen's character as the "Cooler King" plus his escape from the camp on a motorcycle cemented his cinematic image for all time. He co-starred in what has to be the earliest depiction of a one night stand in a Hollywood film, Love with the Proper Stranger (released in December, 1963), Natalie Wood, and played a character very close to his real one in Baby the Rain Must Fall (released in January, 1965), with Lee Remick; both films for director Robert Mulligan. Director Norman Jewison cast McQueen in his film about professional poker players, The Cincinnati Kid (released in October, 1965), with Ann-Margaret, while Nevada Smith (released in May, 1966), with Karl Malden, became his first western after breaking through with Magnificent Seven. Reteaming with director Robert Wise, MacQueen starred in his epic The Sand Pepples (released in December, 1966), with Richard Attenborough. 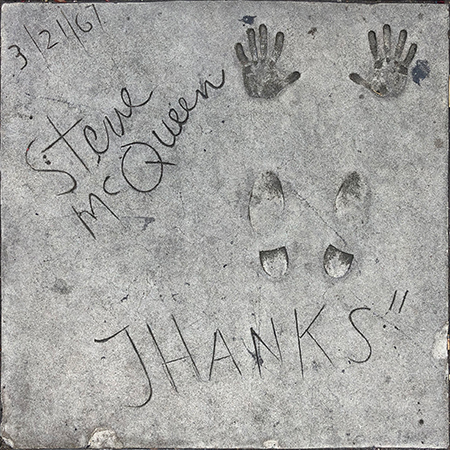 Invited to place his footprints in the Forecourt at Grauman's Chinese, McQueen typically demanded that his block be oriented 180 degrees from all the others; they all face the theatre, while McQueen's faces Hollywood Bovevard. This and Ali MacGraw's are the only ones to run contrary to all the others. McQueen starred with Faye Dunaway in The Thomas Crown Affair (which played the Chinese in June, 1968), then starred in a signature film for him, the police proceedural, Bullitt (released in October, 1968), with Robert Vaughn. In a complete turn-about, McQueen starred in a comic William Faulkner story, The Reivers (released in December, 1969). Le Mans (released in June, 1971), allowed McQueen to finally make a picture about racecar driving, while Junior Bonner (which played the Chinese in June, 1972), with Robert Preston, is perhaps the most mellow film director Sam Peckinpah ever made — curious, isn't it? McQueen's next, The Getaway (released in December, 1972), is significant, since McQueen divorced his wife Nelie, in order to marry his co-star Ali MacGaw (they too, would divorce in 1978). Papillon (released in December, 1973), with Dustin Hoffman, is perhaps the most conventional period film McQueen starred in, unless you can view The Towering Inferno (released in December, 1974), with Paul Newman, as a contemporary film. . . McQueen was paid a pretty penny to appear in the film, which seems to allowed him to take a break from the silver screen. When he emerged from his revery, he decided to make a film of Danish playwright Henrik Ibsen's An Enemy of the People (released in March, 1978), with Bibi Andresson. The low-budget picture was hardly released in the U.S., but Warner Bros. forgave McQueen Enemy with his starring in a western about the legendary Tom Horn (released in March, 1980) with Linda Evans, which did well. The Hunter (which played the Chinese in August, 1980) with Eli Wallach, was McQueen's final film. Having divorced Ali MacGraw in 1978, McQueen married fashion model Barbara Minty in 1980. McQueen had developed a bad cough in 1978, causing the star to give up smoking. Later, it was thought that McQueen had mesothelioma from his exposure to asbestos while in the Marines. With his cancer spreading, McQueen turned himself over to the care of William Donald Kelley, whose unorthodox treatment is still controversial today. McQueen had a large tumor on his abdomen, which he attempted to have removed in Mexico. 12 hours after the surgery, he died of cardiac arrest, on November 7, 1980 at the age of 50. Steve McQueen — The Last Mile, by Barbara McQueen was published in 2006. Grauman's Chinese Theatre, Hollywood, California. Steve McQueen Forecourt ceremony, Tuesday, March 21, 1966. Wife Nelie and Steve McQueen give the camera a look after he has signed his name in the cement.